The latest addition to our collection, making its debut at the November 2008 Open Day. First registered in October 1991, this car was acquired by Mr Piper of Newark in April 1994. It has a mileage of 48,500 from new and is in remarkably original and almost concours condition, having been meticulously cared for by Mr Piper up until he kindly donated it to the Society in October 2008. The Maestro was in production at British Leyland's Austin Rover (former Morris) plant at Cowley, Oxford, between 1983 and 1994, initially replacing the Allegro and Maxi ranges. 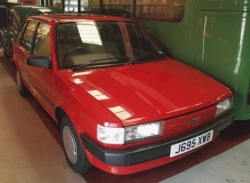 Initially, the car - and the van derivative - were sold either as 'Austin Maestro' or 'MG Maestro', although following British Leyland's re-naming as the Rover Group, later models were sold as 'Rover Maestro' although Rover badging was not applied. The Maestro was a product of BL's then new technology of Computer Aided Design and Manufacture. Early models included a digital dashboard and synthesised voice warning messages, although these were short-lived options. This example has a 1275cc 'A+ Series' engine - this can trace its roots to the Austin Motor Company's small straight-4 automobile engine, known as the A Series, launched in 1951 in the Austin A30, and used in many Austin / BMC / British Leyland cars including the Morris Minor and the Mini. July 2014 - Through the generosity of Paul and Joyce, the Maestro was taxed and MOT'd and was able to participate in the 'Pride of Longbridge' rally. Unfortunately as it is a relatively new car, it has had to have the tax surrendered and it has returned to its slumbers.